Note 3/5: this is a repost back from August 28, 2013. Enjoy! We were off and running early in the morning. We knew it was to be another long day in addition to crossing into Canada. See the route and log below for more info. 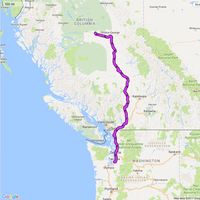 Note 3/5: I’ve moved the full detailed Google Map to the routes page. 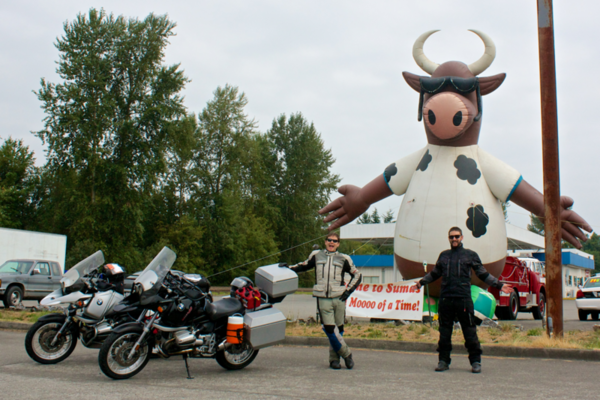 9:31 - Everson, WA: We stop to fill up before the border. Nothing to see here. Move along. 9:50 - Border time: we hit the border shortly after our gas stop. We took some time here to get some pictures. The town right before the border is outrageous. Once we got to the customs booth I got waved in to play the game of 20 questions. The agent started asking the normal questions. She especially wanted to know why I had so many stamps for China and Hong Kong. (A guy has to work right?!) After giving me a hard time with that she asked why we were going to Alaska I answered “For adventure.” Completely valid response. I guess at that point she deduced that I was harmless, waved me through and proceeded to give Gregg the same treatment. So welcoming. 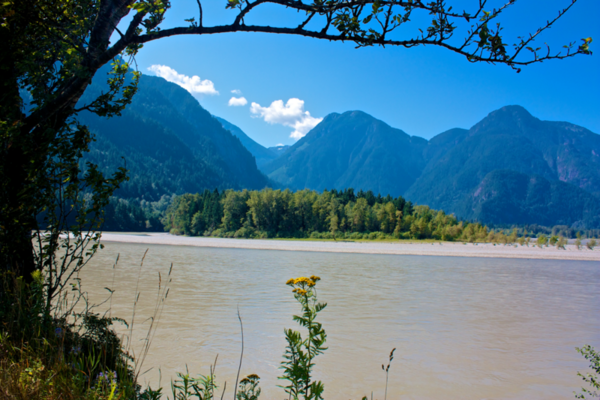 11:00 - Hope, BC: We got our first taste of tall mountains and beautiful waterways. We decided to stop here snap some pictures and grab some, you guessed it, Subway. 13:40 - Cache Creek, BC: More gas. The temperature here was hot compared to how cool it was when we first arrived in BC. We were thrilled to get rained on as we got going again. 17:53 - Quesnel, BC: More gas. We also managed to find a Wal-Mart. I ran in and got some snacks and then we headed to Boston Pizza. We had seen some of their restaurants as we made it though BC and thought to give it a try. Bad choice: the decor was weird and the food wasn’t that great. (and it was expensive too). We ended up getting one of their pizzas but it really wasn’t like the pizza you could get back home. (Gregg worked for a pizza place back home so he knows his pizza.) Wouldn’t recommend it especially if you have some more local/divier choices. 22:15: Vanderhoof, BC: Last stop for the night. We attempted to get to the local campgrounds but we didn’t make it in time. A native offered to put us up in his front yard but we passed on the offer (a little on the sketchy side). We ended up going down the street from where we gassed up to the Siesta Inn. The inn came recommended by the Milepost so we thought we’d try it (and we were tired of riding by then). It turned out to be moderately decent experience. Pricey ( $93.50 for two single beds ) for what you get but it did the job. Note 3/5: Since traveling a bunch, I have found Treasure Notebooks to be a better value and a bit more robust. Check them out! 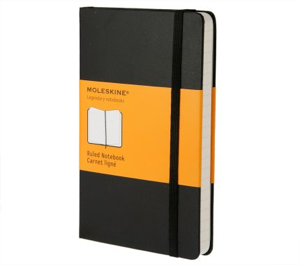 If you are taking an epic journey somewhere don’t forget your moleskin notebook and pen. It’s difficult to say “Oh I’ll remember this!” when next thing you know you’re rounding the corner to something just as interesting and beautiful. Write everything down and take lots of pictures. Your future self will thank you.